The entrance to Magic Ice is the gateway to an adventure both fantastic and far removed from everyday life – a feeling of being beamed over to the Arctic. The entire permanent exhibition is constructed of crystal clear ice – even the glasses at the bar are ice! The exhibition consists of dramatically-lit sculptures and installations with colorful LED lighting to further enhance the ice experience. This presentation arouses the senses of sight, sound and touch. By blending in music and the glow of candlelight, a uniquely magical atmosphere is created. Magic Ice is a concept designed to provide guests with an exceptional experience. This is known as a “wow” attraction, the kind that most people have never seen before – a fantastic natural ice blue world created entirely of ice. Snow and ice art embrace various means of expression such as sculpture, installation art, scenography, land art and architecture, both indoors and out. Enhancing the enjoyment of this experience are the varied forms of expression created by snow and ice. Magic Ice expresses the bond between Man and Nature in a unique way, forming an arena among ice crystals with authenticity and purity. It is designed for a unique world of magic and fun, alive with detail. 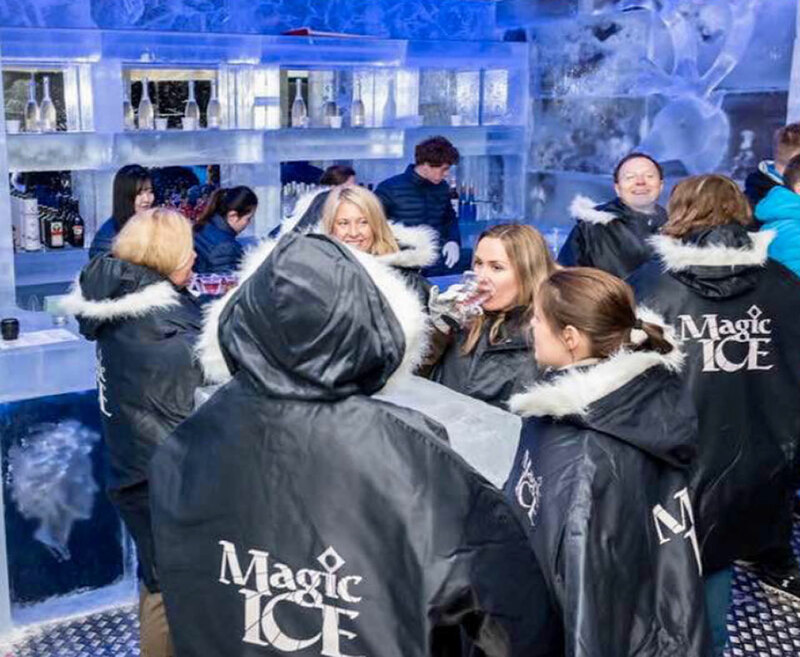 In a magical fairy tale adventure with the wondrous surroundings of snow and ice, Magic Ice presents a truly magical experience, which includes the biggest ice bar in the world. In addition to Magic Ice’s core product – the ice galleries have a souvenir store that sells an assortment of souvenirs related to the Magic Ice exhibition. These items include Norwegian knitting, t-shirts, cups, postcards, and figures of the exhibition, key chains, and other items featuring the Magic Ice logo. Magic Ice is a true winter wonderland that allows guests to become totally immersed in the extraordinary atmosphere of this dynamic new realm of ice, history, and art – providing magical fun to the entire family! A fantastic Natural Ice Blue World Created by Snow and Ice. The ice gallery’s is a wonderful experience for both adults and children. There are many things to see including the experience of beautiful and magical Ice sculptures which you can walk around and admire. Take a deep breath and submerge yourself inside a snow and ice adventure. This is world class ice art. Artists from different parts of the world have created “art below zero” at Magic Ice gallery around the world. They are famous artists, not only within the field of ice carving, but also painting, and sculpting in sand and stone. They have taken part in many ice art competitions all over the world and have received several awards. Magic Ice own Ice Carving School is an Ice Carving institute for our ice artists. Most of our ice artists have received a university degree in art before they start their Magic Ice training in Lithuania. Creating an ice sculpture experience is a specialized skill that requires intimate knowledge, experience and expertise of ice and snow. In the years since Magic Ice was founded, we have continuously developed new and innovative technical equipment. Three years ago we developed an indoor snow cannon, enabling us to produce our own snow. The walls, fixtures and fittings are made entirely of ice and are held together with a mixture of snow and ice. The cannon produce a substance known in the trade as “snice”. In addition to these machines we have also designed special ice carving tools. The Magic North Group culture has been built deliberately and methodically. Magic North Group can design and create and build the most wonderful ice exhibitions in the world, but it takes a specialized team of people to turn this dream into a service-driven reality. Our high service standards are no accident. From the beginning we have worked hard to be a company that offers exceptional service to our guests. We have developed seminars and conduct regular team-building exercises for our employees. Success is determined by our operating as a unified team. Creative, productive, positive employees who are dedicated and committed to hard work guarantee it. These tools are used to grow and implement our exemplary standards, becoming shared experiences for all employees. Each person goes through a rigorous training schedule. They learn our Personnel Guide / Training Manual, as well as an Employee Handbook (Enclosed). The Personnel Guide / Training Manual and the Employee Handbook offer general guidelines to provide our team members with an informational resource to answer common questions and concerns. It also contains key policies, goals, benefits, work procedures, and expectations of the Magic North Group and other information they will need as Magic Ice team members. Our organization has put lessons learned into action and our employees can see and feel the spirit of fun and creativity in the work place. We refer to our team members the “Dream Team”, making them realize that they are a part of something truly extraordinary. Whether we choose a theme to explore the stories and meanings behind a particular culture, discover the fascinating history of a certain region or people, the natural wonders of an eco-tourism site, or just share the joy and wonder of an ice art form, Magic Ice can present an attraction that not only fulfills our vision, but brings our visitors back time and again. The Magic Ice attraction tells a great story that stays with the visitors long after the thrills of the experience have faded into memory. It will not only be the quality of the Magic Ice experience, but also the right combination of wonder and excitement, that give our exhibit that “wow” component. This shapes our vision into a multi-dimensional, smashing success to inspire, entertain and guarantee a wonderful experience for visitors. Experience shows that there will be a need for new and exciting themes/sculptures to ensure repeat visits. The aim is that Magic Ice will be continually developed with new themes, so that it is “renewed” as an attraction/activity every year. Ice Blue and Refreshing – Without You Getting Cold! – We Wish You a Warm Welcome!